Lactate Test Results – Did I get fitter? So, did my fitness decrease or is this identical within the measurement error? It’s actually not so important. A year ago, I concluded that 211W was a high value and I decided to do my steady state rows below 200W. This year I will draw a similar conclusion: Steady state not above 200W. 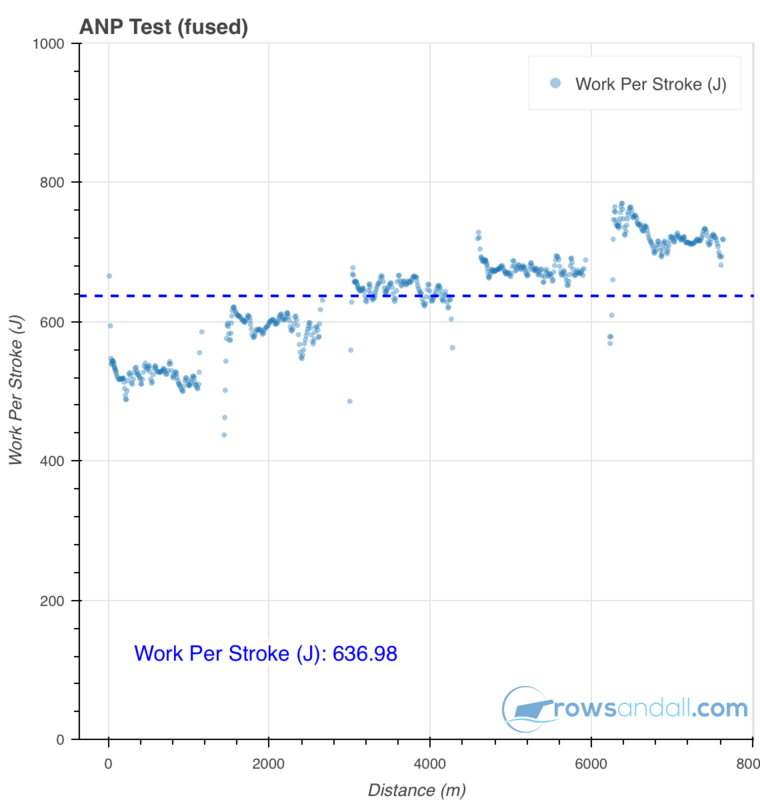 On Rowsandall.com, I will lower my FTP value to 220W. At this point in my training, a 1:57 pace for an hour feels more realistic (and was what I achieved when I last did it, but that was almost a year ago). I took a day off to give my back some rest. I went to the pool before work, expecting to do a shorter, lighter swim, but things went so well that I did the full hour. Almost came late for my first meeting. A weights session. This time I did the full workout prescribed by our club coach. Most exercises at 4×30 repetitions, some at 4×15 or 4×20. It was a good session. I felt it for two days. My back was recovered enough to try one of the erg sessions. This was 3x15min with each 15 minutes as 4 minutes at 20spm, 1 minute at 24spm. Of course with a nice 2500 warming up and a 5 minute cooling down. An easy erg session on the day before the lactate step test. ANP Test day. I was in the 8:30 group so I didn’t have a lot of time for erg test anxiety. I had to go to the club immediately after breakfast, got changed, signed the mandatory GDPR form, paid for the test, and started warming up. The protocol was the same as last year, 5 times 5 minutes with two minute sessions of rest. 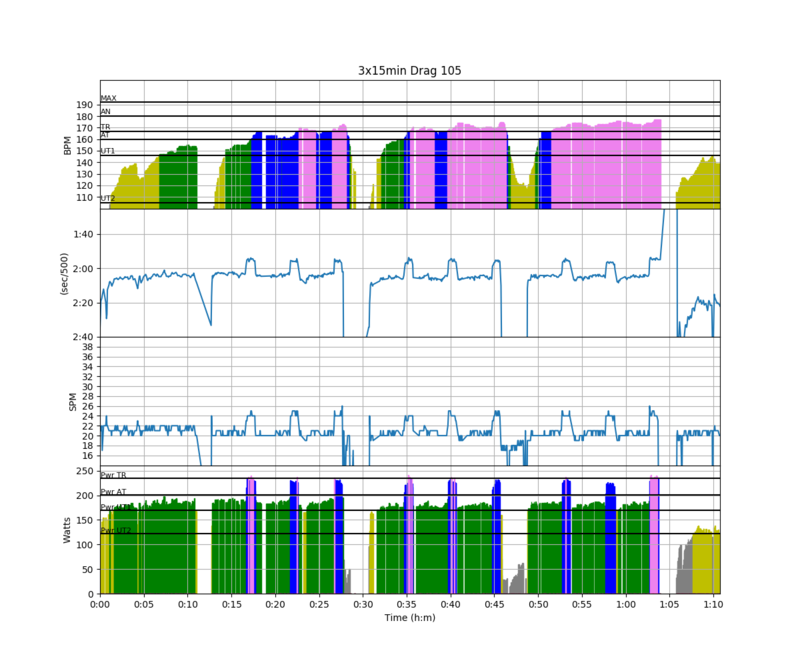 I also rowed the exact same target wattages: 160, 190, 220, 250 and 280W. The scientists had some difficulty getting blood from my ear. Perhaps because my ears were a bit frozen (it was -2C outside). I was curious if I would succeed in the last session, not having done a lot of erging at that power level. In the end it was all right. It was tough of course, but it was doable, especially with the coaches cheering behind us. Of course our men go a bit faster than us Masters. Tomas next to me ended at 410W. I was surprised how close the values are between last and this year. It only seems I have started to Row a bit shorter (but with higher average and peak force). Not sure I am pleased with that. After the erg testing, I rowed a short cooling down, and then I helped getting some eights and fours off our trailer and into the boat house. After that, I did a 5km slow run. From our boat house to the boat house of the other rowing club, turn around at their entrance gate, and run the same way back. It’s almost exactly 5k. Fifteen times in various ways (skipping one step, one one leg, jumps, etc). It’s a hellish workout. I a little behind in blogging because of a business trip. 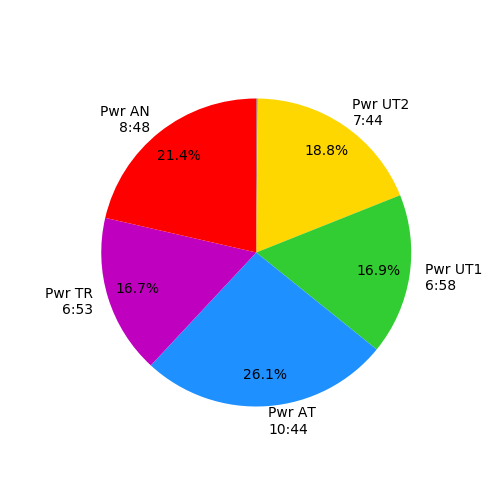 Last Monday, I received the results of Saturday’s lactate testing. 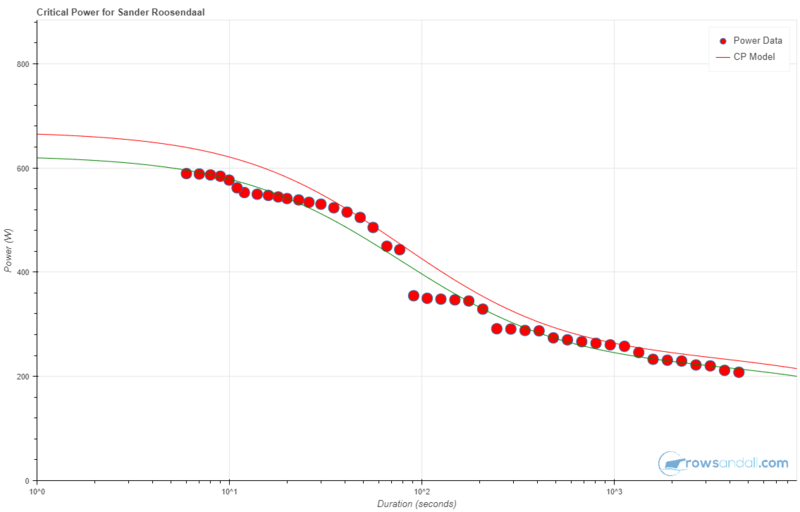 Here is the curve. So if one takes 2.0 mmol/L as the upper boundary for steady state, I should do my steady state below 211.7 W (1:58 pace on the Concept2 erg). That is quite high. I would have to do an extended test to prove it, but I believe I should be below 200W. In my understanding (and I am not a physiologist), the steady state pace is a pace at which the lactate concentration reaches a plateau after a certain duration. So ideally, one would do steady state training and measure lactate every twenty minutes or so. If lactate reaches a plateau, in a next session I would go slightly higher and measure lactate again. Repeat until I find an intensity at which lactate levels don’t stabilize. This is nice in theory, but doesn’t work in practice. If the training is effective, the steady state lactate level could be a moving target as my body gets more efficient in eliminating lactate at higher power levels. This is not such a big problem though. At one point, I would find a measurement at which the lactate level does increase, and after I find that, steady state would mean anything below. A bigger issue is that every day is a different day, and depending on accumulated stress, fatigue and/or sleep deprivation, my body will react differently. 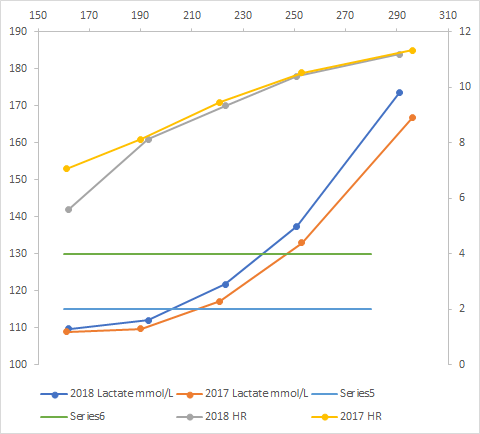 Two seasons ago, I used lactate measurements very frequently, and I found days on which my lactate level jumped above 2.0 mmol/L at light efforts, while a few days later it remained around 1.5 mmol/L for a similar power. I also found that the perceived effort was an excellent indicator for this. Discussing with some Olympic rowers, I found that this is common for people who have been training intensively or for a long time. You learn to recognize the signals of your body. Talking about feeling. When I did the lactate test a week ago, I proclaimed that I “felt” that my Lactate Threshold was at 235W. The test shows it is at 247W, assuming my lactate threshold occurs at 4.0 mmol/L, so a slightly higher value. I didn’t put any short efforts in there, so the curve is definitely inaccurate below 100 seconds, and the long row was a failed attempt at a 1 hour PB, so I may be able to go faster. 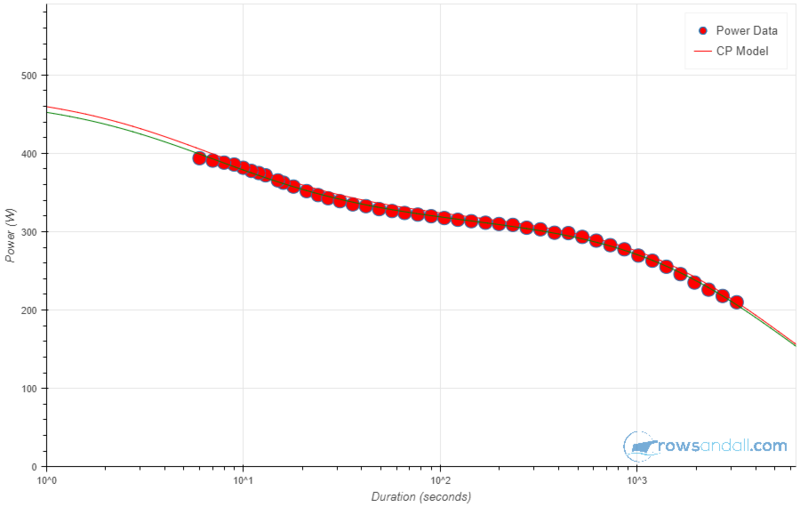 The 2k prediction given by this curve is a 7:00.9 effort, which is close. For the 10k, it predicts a 1:54.5 pace, which I think is accurate, given the last fast 10k I did on the erg, on October 19, 2016, at 1:54.4 pace. So, I don’t think I will be able to hold 247W (1:52.3 pace) over one hour. Actually, my best one hour effort is at 218W (1:57 pace) in 2015, and I put my FTP value at 225W. Perhaps a difference between cycling and rowing. Today was Lactate Day at our rowing club. The kids who are in a performance program get this paid by the federation, and for us Masters and other less promising rowers there is the opportunity to pay and participate. I happily did that, because it is much more convenient than doing it myself. The tests were done by two ladies from the university. We had 6 ergs lined up and the testing protocol was 5 intervals of 5 minutes, with 2 minutes rest. 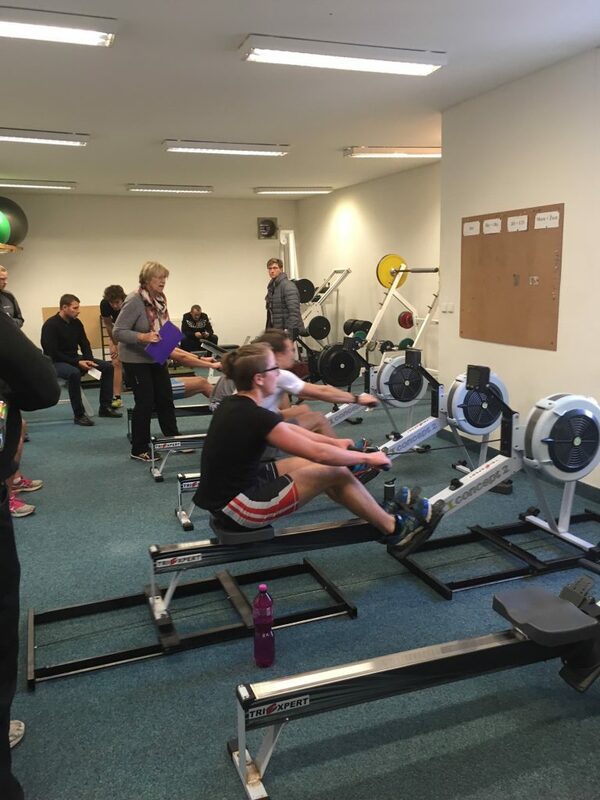 The second erg started 1:10 minutes after the first, and so forth, so the ladies had 1:10 to collect the data after each interval and they were continuously occupied. You finish an interval, the two ladies come to you. One writes down your heart rate, and the other takes some blood from your ear lobe. 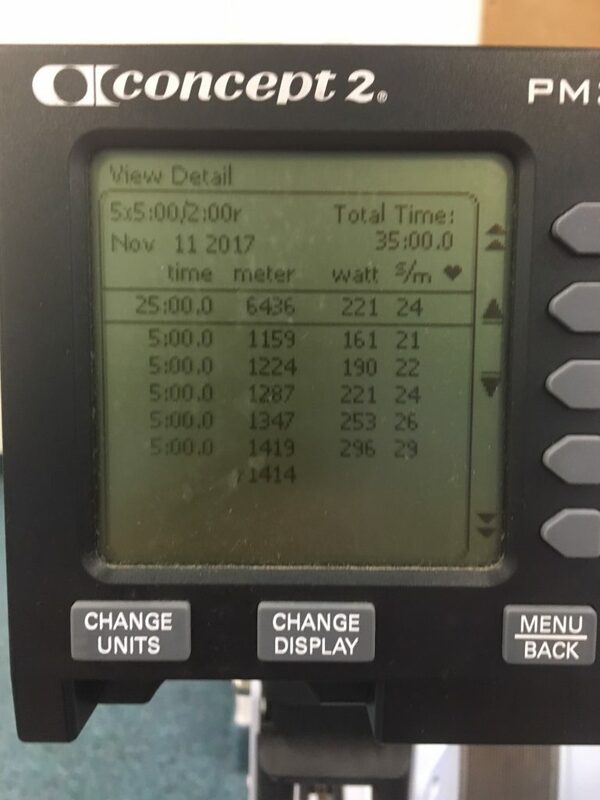 The only thing I had to focus on was rowing at the prescribed Power values. Here is a picture I took after my row, of the last group. Notice that we had participation from the other club in town, who do these tests on sliders. We row on static ergs. For me, the levels were 160, 190, 220, 250, and >280 Watt. 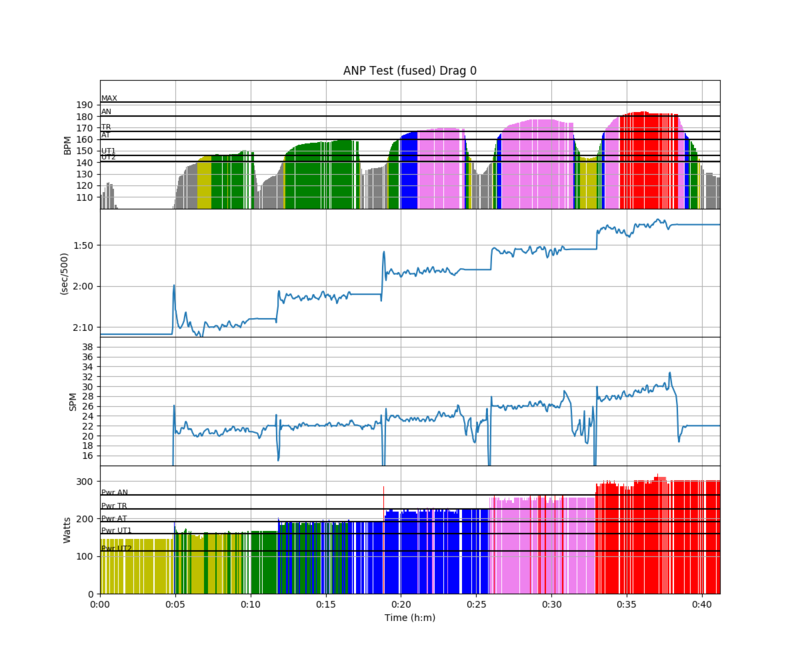 I had to do some data fusion to merge the heart rate data measured with the Garmin and the other parameters measured with PainSled, connected through USB cable to the PM3. I am pretty happy with the power achieved in the final interval. I was quite constant in stroke length, so I obviously varied the force from interval to interval. I am wondering if the Lactate values would be different with constant drive force, varying the stroke rate more. Anyway, the blood samples are now traveling to the lab, and I will know the results on Tuesday. 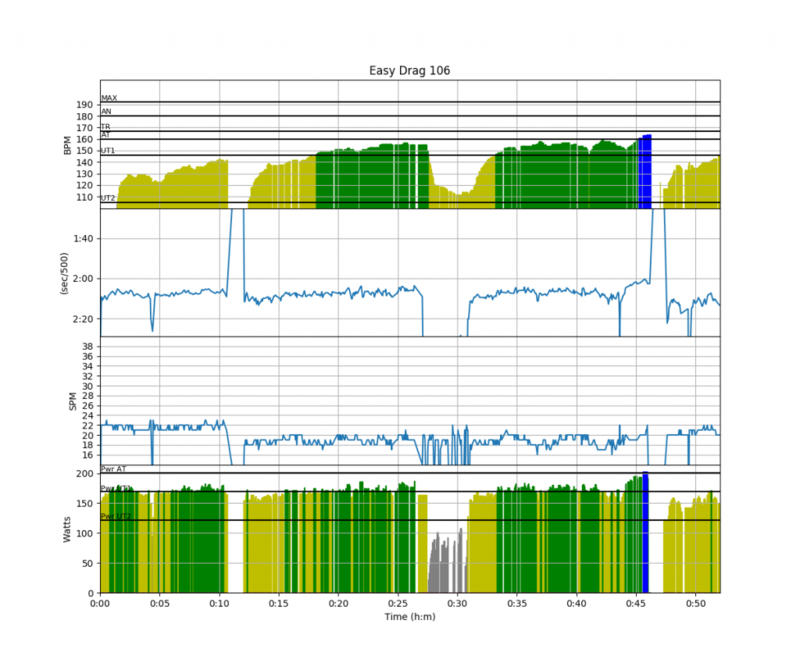 That is the only advantage of doing Lactate tests yourself: you can play with the data immediately.